Ghirardelli Squares in Dark, Caramel and Sea Salt Chocolate. Lindt Dark Orange Chocolate, Cookies, Truffles and more. Each gourmet item is carefully assembled and accentuated with a hand-tied satin ribbon with optional personalization. A free card with your personal message or greeting is included, as well as complimentary scissors so your recipient can easily open their gift. Your gift will leave a lasting impression as they repurpose this keepsake keepsake picnic case, reminiscent of the vintage style of 1940s Europe. Chocolate Decadence is a hand delivered gift. These gifts are delivered by one of our local design centers located throughout the United States and Canada. Same day delivery is available for most gifts when ordered before the cutoff time. The cutoff time for Chocolate Decadence is 1 PM in the recipient's time zone. Ghirardelli squares in dark chocolate, caramel and sea salt. Lindt Intense Orange dark chocolate, Seattle truffles and more. GiftTree signature keepsake case with contrasting trim. This was purchased for my Niece’s birthday. She absolutely LOVED it, the personalized ribbon was gorgeous and the basket was a spinning image of the thumbnail shown! I love this website, it never disappoints! All purchases are always as beautiful as the thumbnails they show on here. One very happy customer! I purchased the chocolate decadence for my Mom for a "Just Because" day. She absolutely loved it. Thanks for making her day brighter and sweeter! The product is so good, beautiful and the same that website photo. Business colleague sent me this Thank You Basket Fed Ex Next Day delivery; my wife and I were both impressed with the sturdy little gift box and its tasty contents! Sent as a Christmas gift. Loved the case it came in! Sent to my son in LA from us in the UK via Gift Tree website . Arrived on time , watched him via Skype unwrap the hamper on Xmas day . Which looked well made and had a beautiful purple bow , which needed the scissors provided to cut the ribbon . The chocolate selection was good !!! Thank you . The person I had the gift basket sent to loved it. Didn't know what to give on Valentines Day so as i was scrolling thru the web site you folks came up. Thank you it was a great gift to give. I will be keeping you folks in mind for future gifting. My wife loved the chocolates. I highly recommend this gift. I usually order from another place but happen to come across this site.Wonderful products for a much better price. This was a gift & they absolutely loved it. I will most definitely use GiftTree from here on out for any gifts I wish to send. Good looking box and amazing service. Fast shipping, good communications and good product. Recommended. This was a gift for my Godmother in assisted living. She absolutely loved the entire gift, from the basket it was packed in, to every item in the basket. She raved about it and showed it to all of her friends at the facility. It was a big hit! The girls in the office decimated this! Seemed to be a hit. I ordered these at the last minute and they arrived as scheduled. The quality was outstanding. I will use Gift Tree again and try to do earlier next year. Also, a great house warming present. Everyone was delighted with the gifts they received. I'm glad I found your site. Ordered for my Mother. Received on time and was a beautiful presentation. She loved how everything was wrapped and how much was in the box. I enjoyed receiving this chocolate basket from my kids for my birthday. I was happy with all the chocolate except the White Chocolate Amaretto Shortbread Cookies. It was very beautiful. The presentation and everything. Very beautiful everything. Thank you so much for such a wonderful experience. I had never thought about sending my husband a gift basket, because I always thought they looked too feminine. This basket was the perfect touch! He loves chocolate and he loves the basket. Thanks for the timely delivery. Everything exceeded my expectations. I will be a repeat customer!! This is literally the best site ever!! I gifted for the first time internationally and with GiftTree my experience was soo amazing. Trust me, this basket looks more beautiful in reality, these chocolates are yummy... I wanted to post the pictures here but there is no option. Don't even doubt a second before ordering it for your loved ones. Thank you GiftTree, may your company reach the heights of success. Excellent service and delivery. Recipient was very happy. Will be buying again in the future. The package arrived in a timely manner. The recipient absolutely loved it. A great surprise to find on her return home. Easy to send a gift to American friends from France. Gave this to the wife for a present, it was simple easy to order and you really can not go wrong with a gift like this. I always try to buy something that she can use later also, like the basket it came in. What a great idea gift tree, like giving two gifts for the price of one! Recipient of gift was very delighted to get this gift. The basket is beautiful. Great service! Will order from GiftTree again. This was for an amazing lady who turned 99 this May. She loves chocolates and this could not have been a more perfect gift. Loved the presentation in the vintage 1940's style basket and delicious selection of chocolates and other sweet indulgences. What a wonderful product! I appreciate your job and your fair work. My daughter was most happy receiving the gifts you delivered. I ordered this for a dear friend of mine while I was not in USA, the package was delivered on time and my friend loved it! I will definitely be using this service again in future. I sent this to a friend who just had surgery she was overjoyed with the gift. This was for a chocolate loving son-in-law and it was well recieved. I purchased this gift for my best friend who lives almost 300miles away. She was blown away by the presentation and loves chocolate. I loved the personalised ribbon and the basket made it special. I sent this gift to a colleague of mine and she reported back that the chocolate even arrived earlier than I planned and was very fresh and beautifully packed. I sent this to more than 20 clients and colleagues. Several have commented on the basket and scissors. The basket is worth saving and repurposing. One client was wowed with the scissors - they just set GiftTree apart and make them memorable. I really liked the gift ribbon I spent the extra $50 on. Also the enclosed card. GiftTree is my go to service for gifts now. I loved the gift I received so much, I ordered the same item to one of my friends for watching my cats. She loooooved it. We gave this to our boss for Christmas because we all know how much he loves sweets. As soon as he snipped it open with the sissors that were included (classy touch) he laughed and smiled. He loved the basket...storage for future fishing lures...and he had us sign the back of the personalized bow to add us to his Christmas tree. This one is a winner...much better than a tie! I bought this gift basket for my daughter's 40th birthday. She absolutely loved it. I sent this to my Parents for Christmas. They Loved it ! And were happy with the way it was presented. Sent to a business-Pikesville Animal Hospital. Great doctors and staff. They all loved it! We are retired and this year was our treat!!! I was so nervous about sending this gift to my future in-laws. Not only did I leave a lasting impression after meeting them for the first time. When the gift basket arrived I received a call and my in-laws were raving about how beautiful it was and the said LOVE IT about 10 times. It was very elegant they said and told me I was a very special person. That really made my heart skip a beat! THANK YOU SO MUCH Gift Tree for a job well done. The wedding is next year around October or November no date yet but we are working on it. I will be back again ordering for my fathers birthday next month. I love you all and continue blessing from GOD above. GiftTree comes through once again! 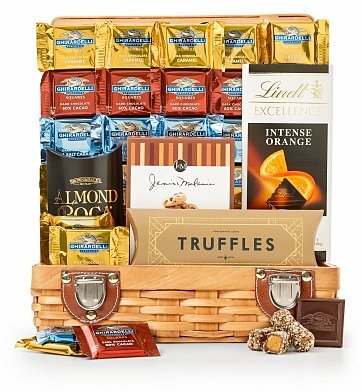 Recipient was overwhelmed by the amount of chocolate included and loved the chic presentation--not the usual basket, but an attractive, small wicker case of which they thought could be used in many ways once the chocolate has been consumed. Thank you, GiftTree for offering such classy gifts. I had never used this website to purchase gifts before & based my gift decision on ratings/reviews that were posted. My aunt was so impressed with the presentation of the gift! Such a nice option, as opposed to the typical flowers or balloons. Who doesn't love chocolate?! I did not receive this item. It was a gift to my niece. She seemed to be delighted with it. Sent one to my 8 year old niece, im in the military so I cant get home much and to reach out I sent this basket to her. everyone was surprised and according to my sister my nieve was more than thrilled. I highley recommend this. Not to mention it got there faster than estimated. and the presentation and packaging was just as described. (optional)The recepients really was excited to recieve the basket and was over joy with it. My sister-in law was very impressed with the presentation and was totally thrilled with this gift! I gave this present to my daughter and her partner for Valentines Day. They loved it! It's always nice to take time and remember those that we love and what better way to honor our them than with chocolate! Enjoy!! All baskets ordered arrived on time and in good condition. The entire transaction was very easy. The recipient loved this. It arrived exactly on the date promised. The presentation was beautiful and the quilaity product excellent! My customer got it the next day! I was very pleased, that over Christmas holiday, the customer received their gift basket the next day. I would recommend my friends to you because my gift was delivered when they said it would be delivered. That very important to me and the recipient. Thank you for your reliable service. I gave this basket as a gift to several people for Christmas & they all had the same thing to say "loved the basket!" It is really a cute & affordable gift. Great for the chocolate lover...overall a great buy! We were very impressed with the service to provide a great gift basket to a friend in Washington DC, and on time as promised, with regular email updates as the gift progressed through the process. It was made even more special with the ribbon wishing the friend a merry Christmas - and including her name on the ribbon - just how unique is that. And by the way - this order was done from Perth Australia - the other side od the world. Well done Gift Tree - we will certainly be using you again. I have to judge each gift I give by the response of those who receive them. In the case of the Chocolate Decadence Gift Basket from Gift Tree, the response was overwhelmingly positive! -great variety and great quality! I wouldn't think twice about using Gift Tree every time I need gifts for important friends...first rate products and first class service! I am overseas and sent this to my family for Christmas. The basket was smaller than I had hoped but beautifully made. Everyone seemed very pleased. The personalized card was on the inside of the mailing tag meaning my mother knew who it was from without opening the box and wrapped the box itself. My family was delighted with this gift. I was very impressed with the service you provided, keeping me up to date at each stage. I would certainly use you again. Many thanks and a Merry Christmas to you. My son and his wife were thrilled , with the variety of these delicious chocolates-----a great way to start "Christmas". I was particularly impressed by how quickly this was delivered. Thanks! The gift was delivered very timely and the recipient loves it. The quality of the product looks excellent. I was impressed by the efficiency of the handling of my on-line purchase and the delivery of it.